Red light plus walk signal means a Leading Pedestrian Interval. Photos by Joe Linton/Streetsblog L.A. Downtown L.A. is getting a little safer for walking with some new traffic signals that give pedestrians a head start. Officially, these are called “Leading Pedestrian Intervals.” The concept is that when pedestrians get the walk signal a few seconds before drivers get a green light, they can walk into the intersection and be more visible, and therefore safer. 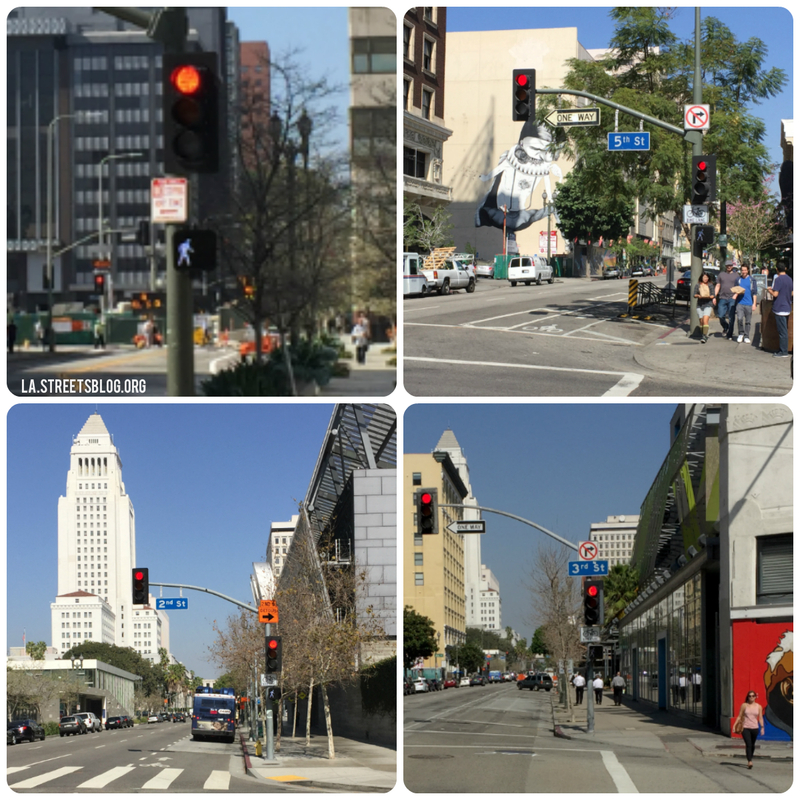 In 2014, the L.A. Transportation Department (LADOT) installed Leading Pedestrian Intervals on Broadway at 3rd and 4th Streets. When I first spotted one last week – adjacent to City Hall, LAPD headquarters and Caltrans District 7 Headquarters, which houses LADOT – I thought for a moment that it was a malfunction. They present as a white-lit walk signal simultaneously with a red traffic light. Then I realized I had been given the go-ahead by a Leading Pedestrian Interval. Unfortunately, impatient right-turning drivers are still getting used to these too. While I bicycled around taking the above photos, I spotted a driver angling right and looking to her left, waiting for a gap in traffic. When the cross traffic stopped for its red, she right-hooked in front of three pedestrians (and me) already in the crosswalk during our leading interval. We stopped. I shouted at the driver, who sped away. Nobody was hurt, but, even with a head start, it is still important for pedestrians to keep an eye out for right-turning drivers. Any updates about the pro-car, anti-walking jaywalking sting operations that were specifically targeting pedestrians in an effort to make driving an automobile in DTLA easier (and walking more dangerous/criminal)? What the driver did was illegal regardless of whether right on red is legal generally. What’s needed is regular enforcement of laws and stiff fines against these clear violations of the pedestrian right of way. Thankfully, since the lead intervals have gone in I’ve seen a lot less of this kind of behavior, perhaps because the streets have enough car traffic that drivers are used to waiting for green before turning (though still not used to looking for waiting pedestrians). I walk these intersections multiple times daily, and they feel much safer with this small change in place. Now let’s get some scramble crosswalks on Broadway in Chinatown, throughout the Fashion/Flower district and at 7th and Fig. Crossing Aliso on Main is taking your life in your hands ! Thankfully that’s not one I cross on a daily basis, but I’ve generally found it (and L.A./Aliso) less harrowing than Spring and 2nd (particularly with the recent closures) or Spring and 5th. Those intersections could probably also use this improvement, seeing as they are the pedestrian gateway from Downtown to Chinatown, El Pueblo and Union Station. Does anyone know whether it is legal for bikes to enter the intersection when the LPI walk signal starts? Or is the LPI for pedestrians only?